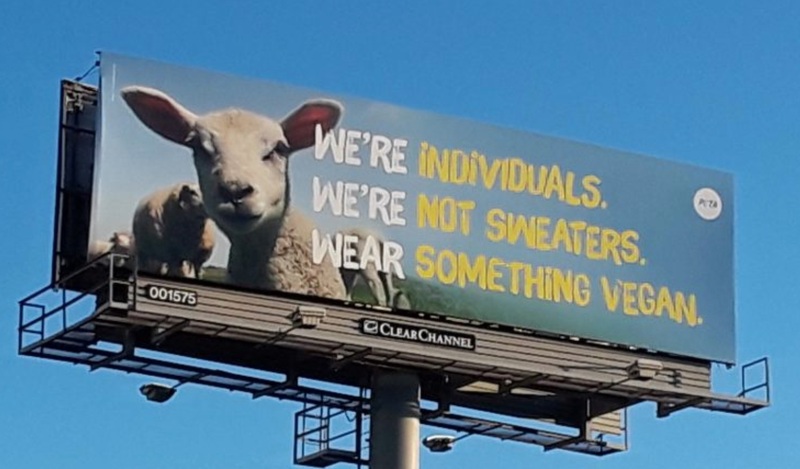 A large pro-vegan billboard urging people to ditch wool and opt for animal-free fabrics instead has been placed in Houston. The board, by vegan charity PETA, shows a sheep's face alongside the slogan: "We're Individuals. We're Not Sweaters. Wear Something Vegan." The organization has launched the campaign across the US, with boards in Boise, Idaho; Madison, Wisconsin; San Bernardino, California; St. Louis, Missouri, and Toledo, Ohio, as well as anti-wool ads on buses in Buffalo and Syracuse, New York, and Louisville, Kentucky. "Just like us, sheep are flesh and blood, feel pain and fear, and value their lives," PETA Campaign Manager, Christina Sewell, said in a statement. "PETA's billboard encourages shoppers to opt for cozy and chic cruelty-free clothing that no sheep were shorn bloody for." Over the last year, PETA has launched multiple exposés of 99 sheep-shearing operations on four continents revealing that the animals are beaten, stomped on, mutilated, and even skinned alive for wool. "Because shearers are typically paid by volume, not by the hour, they're driven to work quickly and carelessly," the charity said. "Strips of sheep's skin - and even pieces of their ears - are cut or torn off during shearing, and the most gaping wounds are stitched up without any pain relief." Many of the adverts are placed near Forever 21 outlets - which has previously come under fire from PETA, which claims it sources wool from Australia. Recent exposés of the Australian wool industry show sheep being beaten. According to PETA, which filmed the footage, Australia is the world's largest exporter of wool and a source of wool used by Forever 21. The charity claims the videos 'show workers beating petrified sheep in the face, deliberately mutilating them, and cutting the throats of fully conscious animals'. PETA is calling now on consumers to boycott the brand until it agrees to stop selling wool. But the chain denies claims that it sources wool from Australia, previously telling Plant Based News: "Forever 21 takes the issues of ethical sourcing and animal welfare extremely seriously and has worked with PETA on several important initiatives over the years, including our fur-free policy and permanent ban on Angora rabbit hair.